What are the benefits of a buckwheat hull pillow? A buckwheat hull pillow forms to the shape of your head and provides support under your neck. It will hold your head while you sleep so that your spine is kept straight. When you first lay down on a buckwheat hull pillow, the hulls will shift under the weight of your head, then the unique shape of the hulls will lock into place, holding that position while you sleep. When your neck muscles aren't overworked keeping your head level, you wake up with less neck and shoulder pain than before - pain that often leads to headaches. Why is a buckwheat hull pillow good for my health? Unlike conventional pillows, buckwheat hull pillows conform to the shape of your head and neck, providing support all night long. It helps alleviate neck, shoulder and back pain, headaches, snoring and tension. The buckwheat hulls used in Kuseno Buckwheat Hull Pillows are thoroughly cleaned and vacuumed making these pillows hypoallergenic. The hulls allow a lot of airflow through the pillow, keeping you cool in the summer and warm in the winter, all without sweating in the night. What are other benefits of buckwheat hull pillows? They are made with 100% all natural ingredients, making them good for the environment. They are zero-waste. When it's time to replace the hulls (up to 10 years), you can add them to your compost or put them directly in your soil. The hulls have no nutritive value and they don't make a very welcome home for bugs, mites or fungus. What are buckwheat hull pillows? Buckwheat hull pillows are pillows that use buckwheat hulls as a filler. The hulls are the outer husk from buckwheat seeds, which are dried, cleaned and vacuumed. The hulls last a long time and don't wear out. Instead, they become polished with use. Buckwheat hull pillows originated in Japan centuries ago but are still relatively unknown in North America. Why should I buy a buckwheat hull pillow? muscle tension in neck and shoulders. What's wrong with my regular pillow? Most pillows hold your head and neck in the wrong position - either too high or too low. If you wake up with a sore neck, chances are it's because of your pillow. It seems that there are as many different thicknesses of pillows on the market as there are people, and then you have to pick a fill. Feather, foam, fibre, styrofoam beads, etc. Kuseno Buckwheat Hull Pillows are designed with a zipper on the end so you can add or remove the hulls to customize the pillow for the perfect sleep. If the pillow is too hard, add a thin, flat Pillow on top of your buckwheat hull pillow inside your pillow case to provide some cushion, while still allowing the buckwheat hulls to conform to the shape of your head, providing underlying support. What are the different sizes of Kuseno Buckwheat Hull Pillows? What size pillow is right for me? It really is a personal preference. The larger the pillow, the thicker it can be while still having the same moldability. For most people, we recommend the 16 x 22 first, followed by the 14 x 20. The 16 x 22 is a great size because it gives your head a little more room on the pillow than the 14 x 20, but not so much that the buckwheat hulls move around a lot. On the larger size pillows (18 x 24 and 20 x 26) the buckwheat hulls can create mountains beside your head if they don't have enough fill. The smaller size pillows don't have enough fabric to give the hulls as much room to move. See our chart on Are they all the same size, to compare the size of the pillow with the weight and thickness. If you're looking for a custom size pillow, contact our friendly Sales staff with your requirements and they'll get back to you on the availability and cost. If you're looking for a specific type of fabric, we may not be able to get it for you but ask anyway. Also let us know how much fill you want. If you don't know how much, we can help figure that out, too. If you're looking for a custom product, due to current commitments (craft fairs, markets, etc), we probably won't be able to fulfill your request. However, feel free to contact our friendly Sales staff with your idea and we may add it to our suggestion board in the office. I've shopped around. Why are your prices so low? We've shopped around, too! Our goal is to make sure you get the sleep you deserve at an affordable price. We have sourced high-quality organic Canadian buckwheat hulls and purchased it in large quantities to keep our costs low. More importantly, we have reduced the profit we make per pillow in order to get them into your hands and under your head. When you are shopping around and comparing prices, be sure to compare our return policy and 1 year limited warranty. You have 6 weeks (from the date of order) to fall in love with your pillow. If it's the wrong size, exchange it for a different size. If you don't like it, return it for a full refund (not including shipping costs). We also guarantee our product to be free of manufacturing defects for 1 full year! If the fabric tears or a seam rips through normal usage, save the hulls in a container and ship the pillow fabric back to us for a warranty replacement. We could not offer a generous return policy and a full 1 year limited warranty if we didn't believe our pillows are top quality. Buckwheat is not a grain like the name would suggest. It is a triangular seed from a fruit that is related to the rhubarb and is native to Asia and Northern Europe. The buckwheat seeds are milled and extracted from the hard, outer shell, then ground into a flour and used to make pancakes, beer, noodles and groats in Asia and Europe. Kuseno Buckwheat Hull Pillows are made with the hulls of organic buckwheat seeds grown in Canada. The hull, or husk, is the hard outer shell of the buckwheat seed that is removed from the seed as part of the milling process. They are dark brown in colour and can have up to 3 sides. One side of the hull resembles a popcorn kernel husk. Why buckwheat hull as a filling? The triangular shape of the hulls allow natural airflow through the pillow, keeping your head cool in the summer and warm in the winter. The hulls have a natural springiness to them and will move to form to the shape of your head when you lay down. Once you're in position, they "lock" into place, supporting your head and neck while you sleep. Most people report that they sleep better after a couple of days and they don't toss and turn through the night. Even if you do turn over, the hulls will reform around your head to continue to provide support. What is the difference between organic and non-organic buckwheat hull pillows? Buckwheat is protected by a tough outer shell (hull) that is naturally resistant to bugs. For this reason, most farmers don't need to use pesticides when growing buckwheat. Organic buckwheat hulls are not only guaranteed to be grown without pesticides and have no harmful toxins or chemicals, but the surrounding farms are also pesticide free so there's no overspray. You're going to spend approximately one third of your life laying on your pillow, you want to make sure you aren't breathing in any harmful fumes. Do the buckwheat hulls wear out or crumble? Kuseno Buckwheat Hull Pillows are not made with roasted hulls, so they will not wear out or crumble. They will become polished with use and over time they will slip off of each other better, providing even better support before the unique shape causes them to "lock" into place to provide support. After a year or two, it's not uncommon to top up your pillow with extra hulls, as the polished hulls take up less volume. This normally only needs to be done once. What is the zippered pillow made of? The pillow is made from 100% cotton and a nylon zipper is used to open the case to add or remove buckwheat. I'm allergic to wheat and grain. Can I still use a buckwheat hull pillow? Buckwhat is not a grain, it is the seed of a fruit related to the rhubarb. It's very rare for a person to be allergic to buckwheat hulls, if they are it's generally due to the fine dust created when the seeds are milled into a flour. Our hulls are cleaned and vacuumed and have virtually no dust. If you develop an allergic reaction from using a Kuseno Buckwheat Hull Pillow, please discontinue use immediately. See our return policy for details on returning the pillow for a full refund. I'm allergic to cotton, can I use a buckwheat hull pillow? We use 100% cotton for the pillow, so it doesn't look good for you. Contact us if you want information on a special order, if you want us to locate a specific type of fabric for you. Or, if you want to make your own pillow, you can buy the buckwheat hulls from us to use as fill. How do I use my buckwheat hull pillow? While this might seem like an obvious question at first, there is a technique to using a buckwheat hull pillow. You will likely adapt this and come up with your own method and if so, let us know so we can add it here! What we recommend is that before you lay down, pick up the pillow so that the hulls gather at the end close to your shoulder. When you lay down, push your shoulder up into the pillow, and rest your head so that the wide hill of hulls is under your neck. Once your head is in place, wiggle your head as you relax your shoulder and let the hulls move to provide support. If the pillow is too hard on your ear, use your finger to poke an indentation for your ear. Can children use a buckwheat hull pillow? Infants should not use pillows of any type. Children aged 1 and older can use the 14 x 20 pillow and you can adjust the amount of buckwheat fill so that it holds their wee head straight. Do buckwheat hull pillows make noise? When you are "fluffing" your pillow, or moving it around, it sounds like a rainstick. When you first put your head down on it, it does have a bit of a crunching noise as the hulls move under the weight of your head, but the noise stops once they lock into place (usually a second or two). You will sleep so comfortably that you probably won't move through the night and if you do, you won't notice the pillow making any noise. How long does it take to get used to a buckwheat hull pillow? A buckwheat hull pillow is probably different than what you're used to. First, it's not as tall, or lofty, as a conventional pillow. Second, it's not at all soft like a conventional pillow. A family member told me, "It's like sleeping on a rock. A rock that is perfectly shaped for my head, but still a rock." Some people like the hardness of the pillow. Finally, you might feel that the buckwheat hull pillow isn't as thick as you're used to. Your head is closer to the bed. You want to keep your head and spine straight and often this means a shallower pillow. If you are a side sleeper, lay on the pillow and shift your gaze so that your eyes are at the top of your eye socket, then look down so your eyes are at the bottom of the socket. Repeat this up/down motion with your eyes a few times. You should notice that your gaze is horizontal with your room. You could also ask someone to look at your head and neck position while you're laying down and see if your head, neck and spine looks aligned. If you have broad shoulders, try placing a thin, flat pillow under your Kuseno Buckwheat Hull Pillow to raise it up. Remember, you want to keep your head inline with your neck and your spine straight. Although most people become accustomed to the buckwheat hull pillow after a few days, you have up to 6 weeks to decide if you don't like it. If you aren't completely satisified with the pillow, return it for a full refund (see our return policy for more details). Can the buckwheat hull pillows be heated or cooled? Cooling the buckwheat hull pillow in a fridge or freezer can have great therapeutic effect to reduce swelling as directed by your physician. We do not recommend heating the buckwheat hull pillow as it can dry out the hulls. Can I use a buckwheat hull pillow on a memory foam mattress? Yes! You can use a buckwheat hull pillow on any bed type. The buckwheat hull pillow works on the same body-shaping system as a memory foam bed or mattress topper, and the zippered side allows your to add or remove hulls to best meet your needs. A softer bed that lets your body sink lower will need a pillow with less fill in it. A firmer bed will require a pillow with more fill to keep your head aligned. Where else are buckwheat hull pillows used? In addition to being used as bed pillows, they can also be used as pet pillows. You might find the pillows used in spas, massage parlours, bolsters used for yoga, travel pillows, and even wrist or back support. Can I use a buckwheat hull pillow in a pillow fight? We do not recommend using our pillow in a pillow fight. Not only would the increased weight of the pillow (3 to 8+ pounds, depending on the size) give you an unfair advantage over your opponent, this use is not covered under the warranty if it should tear. How do I clean my buckwheat hull pillow? To clean the outer fabric, open the zipper and empty the hulls into a suitable container. Make sure to get all of the hulls out. The pillow fabric is 100% cotton, so you can put it in with your wash but if you dry it with heat, it could shrink! We recommend hang drying the pillow, or tumble dry with no heat. When the pillow is dry, add the hulls through the zipper. Do not wash the buckwheat hulls because they take a long time to dry. To freshen up the hulls, place the pillow in the sun, or empty the hulls and place them in direct sunlight (indoors or outdoors) for 2-3 hours a couple times per year as the weather permits. We recommend doing this at the beginning of spring, and near the end of summer or beginning of fall. The hulls are not nutritive and are naturally uninviting to bugs and mites. We have not heard of a single case of an infestation in a buckwheat hull pillow by any manufacturer, when used regularly. If the pillow is going to be put into storage or not used for long periods of time, it's recommended to seal the pillow in a bag and placed in a freezer for one day per month, and again for a couple days before you're ready to use it again. How long does a buckwheat hull pillow last? Buckwheat hull pillows typically last anywhere from 5 to 10 years. The cost might seem high at first, compared to the $10 pillow bin at the local discount department store, but considering the cheap pillows flatten out and need to be replaced often, the buckwheat hull pillow saves you money over time! What is the flaxseed hot/cold therapy pack filled with? We fill our flaxseed hot/cold therpay packs with 100% organic, Canada-grown flaxseed. After doing extensive temperature tests with different natural grains (rice, wheat, oats, barley, buckwheat, popping corn*), we found that the flaxseed held on to the heat the longest. The oil in the flaxseed acts like a mini oil heater and not only heats up quicker than other grains, but it stays hot longer. * We didn't try popping corn as a filling for the heat packs. We just got hungry after all the testing. On the larger pieces (neck wrap, shoulder wrap, back wrap) you can expect it to hold on to the heat for up to 30 minutes. Your body could adjust to the heat sooner than that and you'll think it's not hot but if you touch it with your hand you will notice some heat still. If you need it hotter, just pop it back in the microwave for 30-60 seconds (depending on the power of your microwave) and warm it back up. It will stay warmer for longer if you place a towel or blanket over the therapy wrap to trap the heat in, but be careful not to do that if it's very hot! You don't want to burn yourself. The smaller pieces won't stay hot for as long. The pocket warmers are about 10 minutes, the eye pillow about 15-20 minutes. You can expect it to stay cold about as long as it stay hot - up to 30 minutes for the bigger pieces (neck wrap, shoulder wrap, back wrap), 10 minutes for the pocket warmers, and 15-20 minutes for the eye pillow. If it's a hot day and the air is warming it up faster than you'd like, pop it back in the freezer for an hour. For best results, we recommend buying multiple therapy packs and rotating them so you always have one cold. How do I heat it up without a microwave? You can't. We have been given some suggestions from some customers, but we can't comfortably offer that advice online. They suggested placing the therapy pack on a cookie sheet in a cold oven, then preheat the oven to the lowest temperature possible. When it dings it's ready. We don't recommend you do this because the flaxseed or cotton fabric could catch fire in the oven if left unattended. The best advice we can give is to dig that microwave out from the basement or buy a new one for the specific purpose of heating your therapy pack. Or, visit your neighbour for a cup of tea and use their microwave while you're there. You can spot treat the fabric with a damp cloth. Don't get the flaxseed wet! It will get mushy and gross. We don't make a washable cover for the flaxseed therapy packs because they're intended to be used on the outside of your clothes where they shouldn't get soiled easily. If you are insistent on using a washable cover, just wrap it in an old cotton T-Shirt. What filling is used to make the blankets heavy? 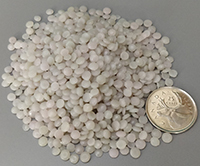 High Density Polyethylene (HDPE) pellets. Small pieces of smooth, rounded plastic. Isn't plastic bad for the environment? HDPE does not contain BPA, Phthalates, heavy metals or allergens. HDPE plastic is the most environmentally stable of all plastics, giving off no harmful fumes into the environment. We partnered with a company that recycles HDPE plastic and diverts the plastic from the landfill. This company processes plastic from food grade containers (like milk jugs). After your blanket has reached its end of life, you can recycle the plastic responsibly to keep it out of the landfills. Why not use buckwheat hulls? Buckwheat hulls are surprisingly light compared to HDPE plastic. Our blankets would have a much lower maximum weight if we used buckwheat hulls. For example, a 30 x 48 blanket has a weight range of 5-20 pounds using our plastic pellets. but only about 4 pounds maximum with buckwheat hulls. Also the hulls cannot be washed. What other materials could be used to fill a blanket? What does it feel like to use a weighted blanket? Some say it's like a full body hug. Some liken it to the lead vest the dentist puts on you when you get X-rays. Have you had a dog or cat lay on you? It's like that but spread out evenly across your body and without them stepping in uncomfortable places.